Is your babbling baby the next Shakespeare? Baby babble… it’s sooooo cute! But it’s also an important part of brain development. Infancy is when babies hear and try to mimic the sounds around them. This exercise lays down the brainwork for language. Does it affect future reading ability, too? Meet Kelly Farquharson of Florida State University. She and her team tracked and recorded nine babbling babies until the age of six. The team looked at how many vowels and consonants infants could string together. This measured how complex their babble was becoming with age. When they were six, the kids were tested on their reading skills.. Turns out, babies whose babbles were ahead of the curve scored higher in reading tests! 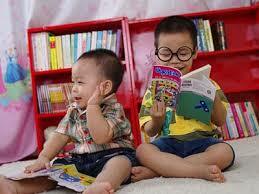 The researchers think that examining babbles can predict reading impairment. This is excellent news! Why? Reading tests can’t be done until kids already know how to read. Early diagnosis tools can tell us which ones will need extra help with their ABC’s. So babble on, tiny bard or bardess! It’s good for you!